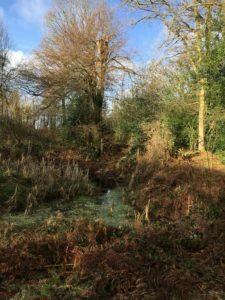 The Gathering will be based entirely outdoors, involving a reflective walk through the woods and fields with pauses for readings and reflection. There will also be opportunity to share bread and wine together in Holy Communion in the woods towards the end of the walk for all those who wish to do so. The pace will be fairly easy but there are a couple of steepish hills. The ground is rough with mainly unmade paths through fields and woods. The ground is quite rutted in many places and in wet weather parts can become fairly muddy. Please consider carefully whether you are able to safely manage this kind of terrain … we are aware that this event may not be for everyone. At the same time, we hope that there will be others who may feel more comfortable with this type of event than with a church based activity, so do think about whether there is anyone you know who might be interested. Our meeting point will be at the benches at the top corner of the cricket green at Downley Common. The road around the edge of the green is Plomer Green Lane. There is space to park at the side of the road around the edges of the green, especially at the corner by the benches. For directions either on-line or with a satnav use the postcode HP13 5YQ which is the postcode for a nearby pub, ‘Le De Spencers Arms’. You will arrive at the cricket green before you arrive at (or see) the pub, so be ready to park before you get there. Please note that we do not have access to toilet facilities, however the pub mentioned above does have toilets for use by customers only. They serve lunch on Sundays between 12pm and 3.30pm if you wanted to eat there beforehand, or have a drink afterwards. Please come suitably equipped for a walk in potentially wet and chilly weather. Sturdy boots or wellies will be essential, even if dry on the day, and some may find walking poles helpful for an ascent up a muddy path in the woods. We will be pausing intermittently for readings and reflections so bring an extra layer if you get cold when standing still. Do bring a waterproof coat, and you may wish to bring an umbrella if it looks likely to rain hard! There is no booking for this event. We will leave promptly at 3pm with whoever has arrived and we will go ahead whatever the weather. We look forward to seeing you on the 17th March as we seek to encounter the mystery of God in the wonder of nature.